PEORIA, Ill. (February 22, 2016) – Philippi-Hagenbuch announces its new Sand Spreader Body designed primarily for mining but with benefits in a variety of other applications including construction, aggregates, quarries and landfills. The three-part system provides a safe and efficient way to add traction to the sometimes hundreds of miles of icy haul roads often found in mines. The three-part system fits 2016 models of PHIL’s patented line of Rear-Eject Bodies and includes a Grizzly screen along with the Sanding Attachment. The removable grizzly attaches to the PHIL Rear-Eject Body with two interlocking plates. The screen features a heavy-duty, interlocking lattice of steel to prevent material larger than 2 inches in diameter from passing through, protecting the auger while assuring all the material in the body is usable. The ejector blade pushes the material to an auger which loads the spreader chutes and material is then dispersed through a set of spinners for even material distribution. The flow of the sand or material being spread is controlled in part by the ejector blade speed. The spreader attachment offers a significant return on investment because buyers avoid purchasing a dedicated piece of equipment. Operators can use the PHIL Sanding Attachment to add traction to icy roads during winter then use the Rear-Eject Body to haul material during the spring, fall and summer. Adding and removing the attachment is easy with just two hooks and a tailgate pin holding the spreader in place. The system can be detached and the truck back on the road for hauling within the day. Unlike traditional solutions for mining road maintenance which dump the sand between the front and rear wheels of the truck, the PHIL Sanding Body evenly distributes the material across the road surface. The PHIL system virtually eliminates the risk of damaging or prematurely wearing tires on the Sanding Body and in turn helps save on maintenance costs. The operator can make a simple in-cab adjustment to optimize the amount of material being spread, while being in complete control over material discharge - something that cannot be done with gravity fed solutions. PHIL constructs all of their products to stand the test of time. The system is made from Hardox 450 steel and is designed for maximum productivity. PHIL builds the auger and the spinners out of heavy-duty steel designed specifically for the mining industry, and the PHIL Rear-Eject Body out of high-strength, abrasive-resistant steel to withstand years with little more than typical preventative maintenance. PHIL designed the system with few moving parts, which also contributes to less required maintenance. 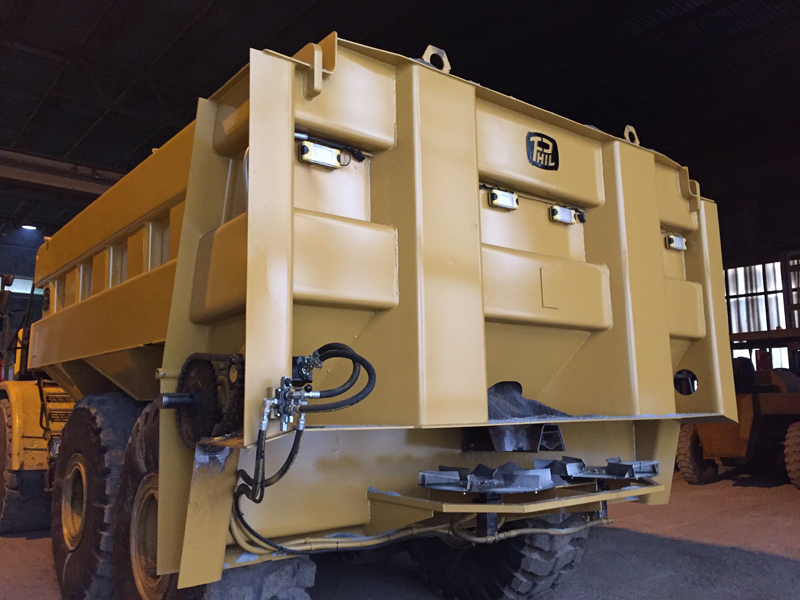 The system is derived from agriculture and highway technology, but PHIL adapted it for the heavy-duty mining environment.